Jemison Faust received an MFA from the School of the Museum of Fine Arts in Boston. 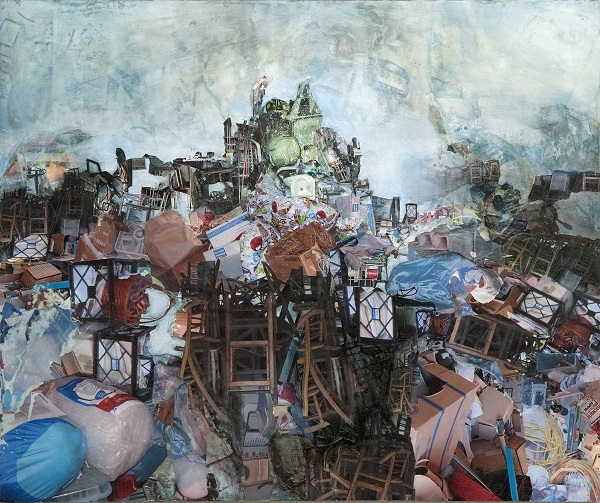 Her work has been exhibited at the Newport Art Museum, the Amos Eno Gallery in NYC, the Erector Square Gallery in Connecticut, the Cushing Martin Gallery at Stonehill College and the Fitchburg Museum. Her awards include a Fellowship in Painting from the RI State Council on the Arts and a Fellowship from the MacDowell Artists Colony. She twice received 1st place in Painting and twice received 1st Place in Mixed Media at the Newport Art Museum’s Annual Juried Exhibitions where, in 2017, she was winner of “Best in Show.” Her work is represented by Atelier Newport in Newport RI and the Bromfield Gallery in Boston. These many layered collage paintings are loosely based on amusing and poignant conversations I have had in my work as a Personal Organizer as well as the larger issues raised by the journey through someone’s life.